I love wind chimes. Always have. Heard once when I was little that wind chimes keep bad spirits away from a home. And I love the way they sound, especially if there is just a small breeze. Just enough to make the chimes play. I especially am a fan of the deeper tone chimes. They generally are larger in diameter and length and remind me of church organ music. These are what generally decorate my decks, both outside the kitchen and the master bedroom. But alas, as with most things that decorate the outdoors, the weather wears them down. I have found the chime tubes on the deck, on the ground below, even all the way out in my garden. Sometimes I can repair the chimes, sometimes not. I have kept a number of the tubes and finally got around to creating a new chime with the collected chimes. I was able to cut a rectangle with rounded edges out of a 1×4 piece of pine. I drilled holes down each side and started threading a synthetic heavy string. I used plastic beads on each side of the tube as well as on top of each thread. 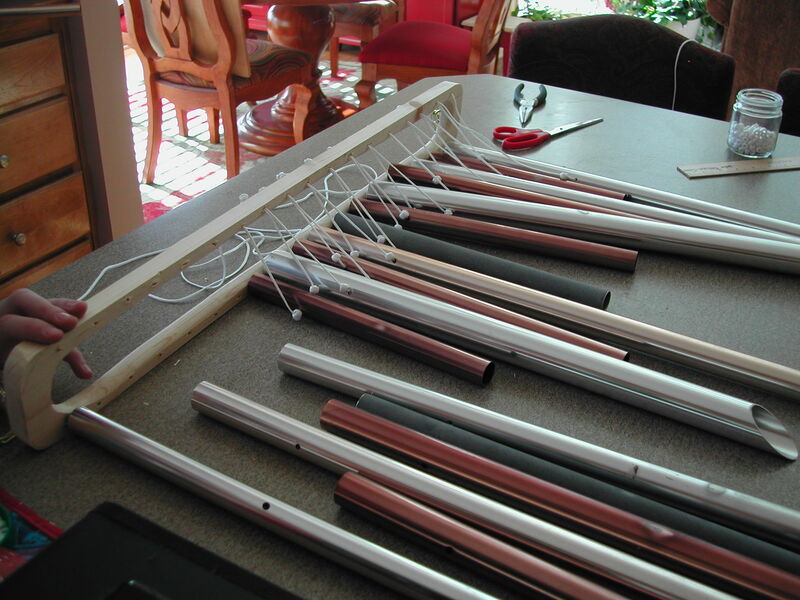 Once I completed one side, I draped the tubes over the edge of the counter and clamped the frame down. This enabled me to thread the other side without difficulty. The whole process took less two hours. 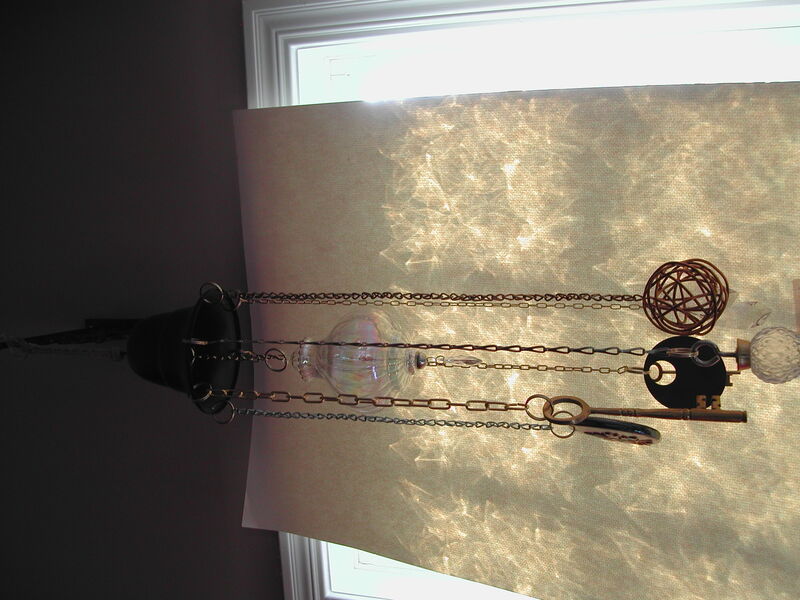 I then used two pieces of leftover chain from another project and attached to each end to hang the whole chime. I had originally planned to use the piece of wood cut from the middle as ‘clanger’ or the thing that hangs down between the tubes and allows the tube to strike it… but it broke and I haven’t found a replacement yet. The tubes seemed to create enough sound just banging into each other, so I may not need it. Hanging next to it is a chime I completed a few weeks ago. I had seen something similar in a catalog – made with a tea kettle and cups and spoons – but I wanted to do something in red and white. I actually had the pan lid from my parents’ estate and started from that point. 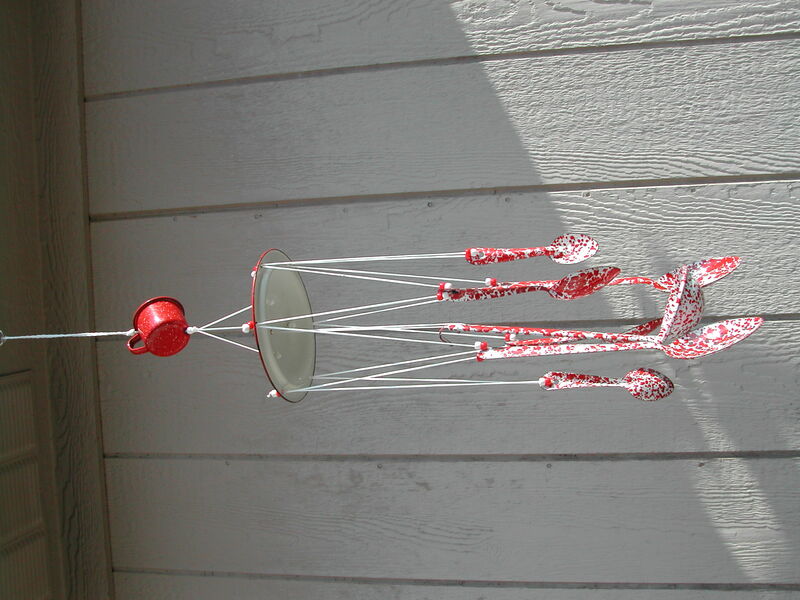 I purchased the enamel splatterware spoons and the ladle from different sellers on eBay and then used the same heavy synthetic string and red and white beads. Only the lid and the cup at the top needed to be drilled, all the spoons and the ladle already had holes at the top. It actually has a great sound, almost like listening to my grandmother in her kitchen on a cold winter day cooking. The third chime came from an idea I saw on Pinterest.com. I have always been a ‘saver’, never been able to throw out or get rid of interesting and old pieces. I collected all those old pieces and added a couple of ornaments that fit into the same category and assembled into two different, yet similar, chimes. I found an ornament of two brass-looking bells to use as the base, drilled the holes around the edges and using a variety of chains I picked up from Ace Hardware, I put together these weathered looking chimes. It seemed a little fragile to actually hang outside, the ‘clanger’ is actually a glass ornament. So I installed a rustic looking hanger in my bathroom. (The window is actually glass block making it difficult to photograph.) I gave the other one, very similar to this one, to a friend. It doesn’t actually cause a ‘twinkling’ because there isn’t a breeze, but I love the way it looks anyway. 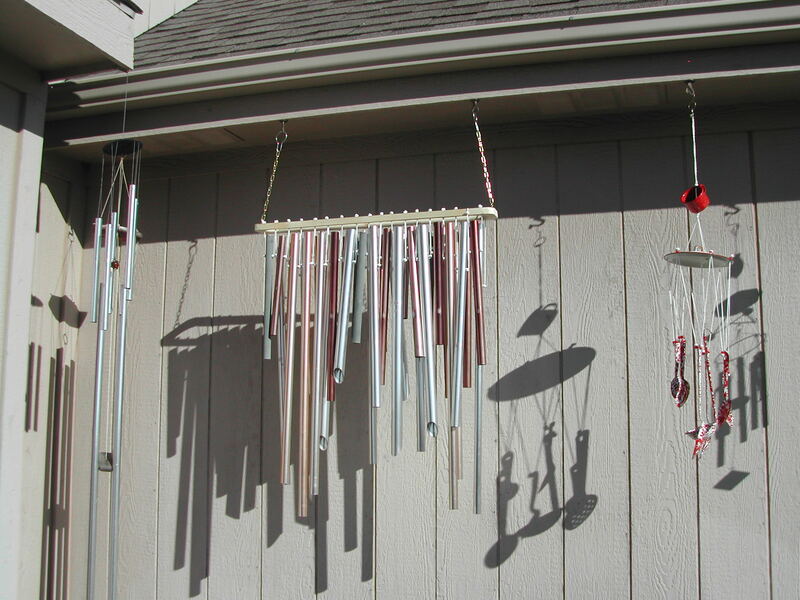 Well, I’ve pretty much used up everything I was going to use to create chimes and have once again lined each side of the eaves of the decks on both the kitchen and master bedroom. I think I am set to keep all the bad spirits at bay.